Meenakshi Sundararajan Engineering College is one of the most reputed colleges under Anna University. 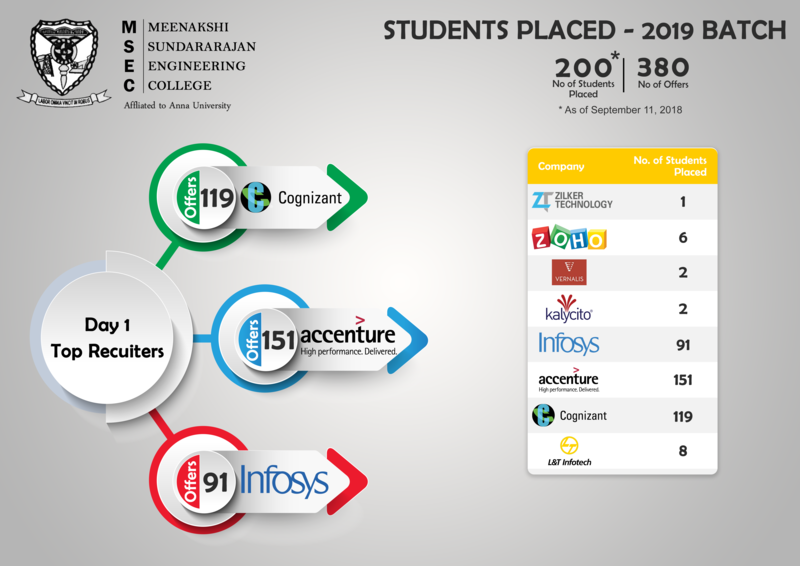 The college aims at providing the best placement opportunities to its students. 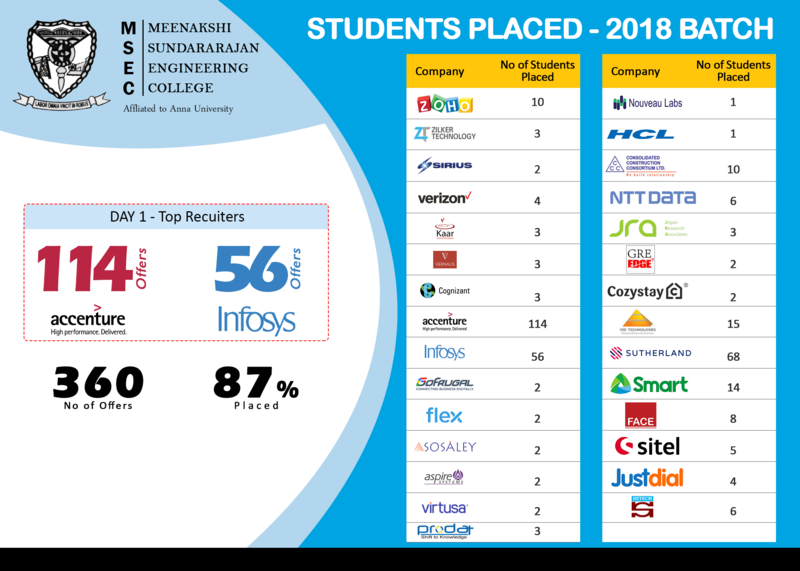 Meticulous efforts are taken by the Placement Cell to ensure that the students are recruited by top-notch companies in the industry. The Placement Cell functions under the leadership of a Placement Officer, faculty representatives and Coordinators from each and every department. The ultimate aim of the Placement Cell is to achieve 100% placement. Reputed institutes are hired to provide training for aptitude tests, group discussions, preparations for Technical and HR interviews. This training grooms our students to face the campus interviews with confidence. JLPT-Japanese Proficiency Test for level N5 is undergone by the students during the first semester. The training for the same is given by ABK-AOTS Dosokai. The training is provided to develop basic communication skills in the language. Extensice training is provided to students in programming languages such as C and C++. This enables them to develop in-depth knowledge so that they can code their projects efficiently. The English Department conducts various activities periodically to help students improve their English communication skills. Oratorical competitions are conducted for first year students. The students of second year are encouraged to present a project in their third semester. The project focuses on interviewing eminent personalities in the industry. These projects and competitions prepare the students to attend campus interviews with confidence. Seminars are conducted regularly on current trending topics to keep the students updated with the technology. These seminars are conducted by eminent personalities from various industries to bridge the gap between industry and students. All departments host a one-day technical seminar every month.